A US naval destroyer sailed within 12 nautical miles of a Chinese island in the disputed South China Sea, the Pentagon said on Tuesday, a move that could irk China. The decision to go ahead with the mission is certain to anger China, which said last month it would "never allow any country" to violate its territorial waters and airspace around the islands, the Washington Post reported. The patrol was completed without incident, said a US defense official said, who spoke on condition of anonymity to discuss the Lassen's movements. The sail-through took place Tuesday, China time, according to China's Foreign Ministry. According to Defence Department officials, the warship USS Lassen conducted a patrol within 12 nautical miles of Subi Reef, which is one of the land masses to which China lays claim within the Spratly chain of islands in the South China Sea. The Barack Obama administration has long said it will exercise a right to freedom of navigation in any international waters, including in the South China Sea. The point of sailing a US ship within 12 nautical miles of any of the artificial islands created by China would be to demonstrate the US assertion that they are not sovereign Chinese territory. "United States would operate, fly or sail anywhere that international law allows. And that certainly includes the ability of our navy to operate in international waters," White House Press Secretary Josh Earnest said. Earnest said this is a critically important principle, particularly in the South China Sea, because there are billions of dollars of commerce that flow through that region of the world every year, and maybe even more than that, and ensuring the free flow of this commerce and freedom of navigation of those vessels is protected is critically important to the global economy. "We have been clear that we take no position on competing territorial sovereignty claims to land features in the South China Sea," Defence Department spokesman Capt Jeff Davis said. China's foreign ministry confirmed that the USS Lassen entered within 12 sea miles of Chinese reefs in the South China Sea, and said that the action was illegal and without Chinese permission. 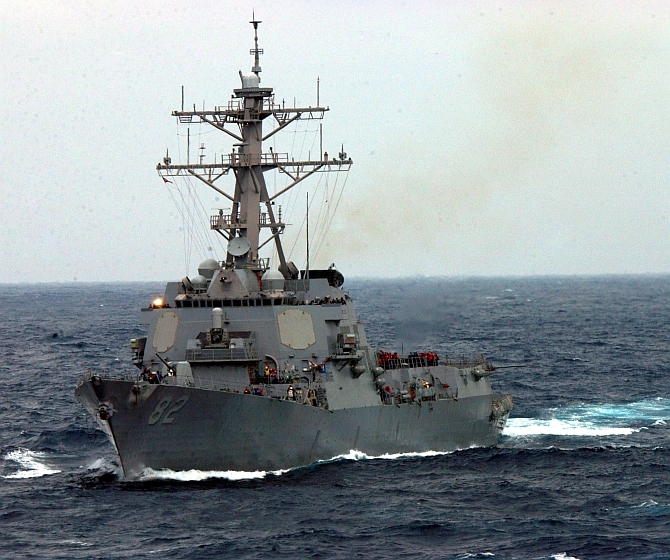 "The actions of the U.S. warship have threatened China's sovereignty and security interests, jeopardized the safety of personnel and facilities on the reefs, and damaged regional peace and stability," the ministry said in a statement posted on its web site. "The Chinese side expresses its strong dissatisfaction and resolute opposition," it said.